I finally made Tiramisu at home for the first time a few weeks ago. (I have been too lazy to actually decipher the recipe from my scribbled notes until today.) The dessert turned out well, a little too well, actually. And we had so much left over that we ate it for “first” breakfast three days in a row. Our Tiramisu came together without incident, which was surprising considering we referenced three different recipes. 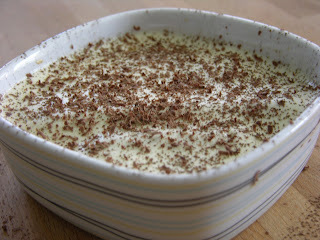 But we ended up with a fairly simple, yet guest-worthy dessert that can be prepared and consumed in the same evening. (Ahem, and it also makes a good breakfast snack). - just a note - This recipe contains raw egg whites; if that makes you feel squeamish, you can try using pasteurized egg whites for peace of mind. It’s my personal opinion that as long as your eggs are fresh, there’s nothing to worry about. I’ve been eating raw cookie dough for years without incident. 1. Whip the heavy cream until fluffy/slightly firm with an electric mixer. Set aside in fridge. Clean beaters well. 2. Combine egg yolks, vanilla, and sugar in heat proof bowl and cook over simmering water until the mixture becomes very pale and starts to pull away from the bowl. Stir constantly with a whisk while cooking. (This may take a while so be patient.) When mixture is done, set aside to cool to room temperature. 3. Beat the egg whites until firm peaks have formed. 4. Stir the egg yolk mixture in with mascarpone cheese and mix until well integrated. Then gently fold in the whipped cream and egg whites. You should end up with a silky, extremely creamy mixture. 5. Mix coffee and booze in a small bowl, and dip each of the ladyfingers in the liquid for a moment, then begin layering small shallow dessert dishes or bowls. Top lady fingers (about five per dish makes a good sized dessert) with the creamy mixture until covered. 6. 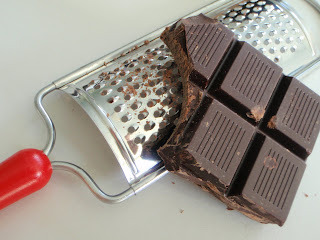 Lightly dust with semi-sweet cocoa powder and use a grater to top with chocolate shavings. *To make superfine sugar, I just take regular granulated sugar and zap it in the food processor for a few seconds.